Indians are becoming Addicted to Apps , Because of Some Low price of smart Phone of Samsung, Micro Max etc , They can access to apps Market and Download App, Games that are free or few rupees More frequently. According to the new Tech News Site flurry , Indian Downloaded 10 Million Apps in Last Few Holidays. This shows that How Indians are passionate about new technologies and App Market , Most of apps Downloaded are of platform Android , I-phone rather then other platform.. Instead US , have broke new record by download 509 millions of Apps This Holiday week , and second place is hold by China with 99 millions Apps . In its most recent report, Flurry estimated that a record-breaking 6.8 million iOS and Android devices were activated on Christmas Day, along with an equally record-breaking 242 million application downloads. Apps Market For Any Plate From is Increasing like a heaps and Bound in few of Months , Last Year 2011 , Windows phone Seven Crossed 50,000 Apps in 14 Months and More surprising think is that to acquire the number 40,000 to 50,000 it takes only few days . You can think How Fast Windows phone market is Growing. 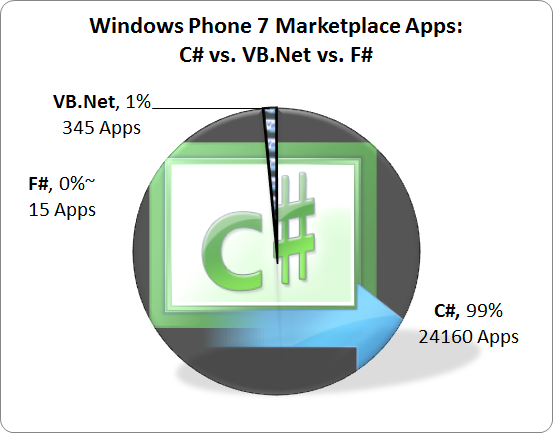 Most of the Apps are Made in C# , only 1 % from VB.net. Another Strange thing is that only 26% Downloaded Apps Are Used Only Once, So if you are App Developer Make sure your App is interesting and Hold You Users.